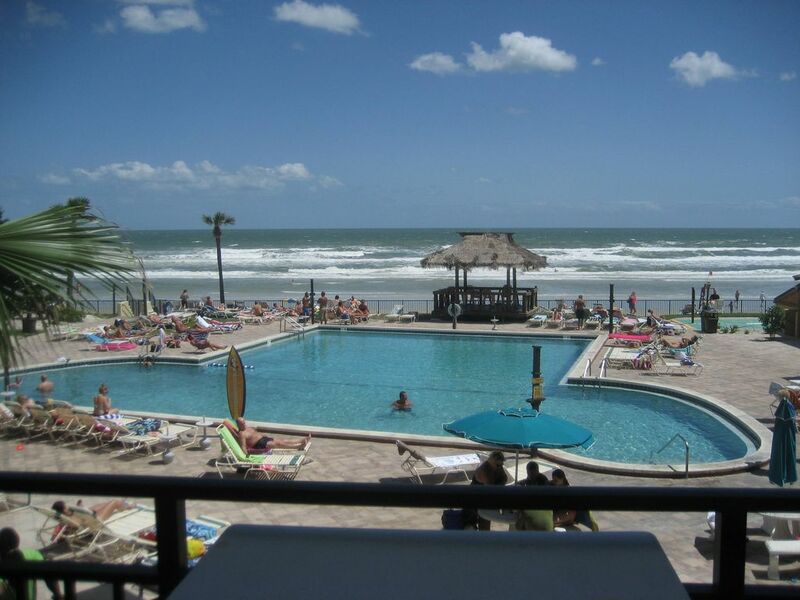 Our Sun Sea and Sand Vacation Condo is one of 3 we offer in the Daytona Beach area. The kitchen has been expanded and new cabinets, sink, stove and large frig have been added. The living area has a new sleeper sofa and a new recliner. New drapes, new slider patio door complete with screen. You can leave the door open to hear the ocean without fearing the insects. The balcony is a wonderful place to have your coffee and watch the sunrise. Everything you may need is provided since this is also our home away from home. In the evening the view the ocean, moon and stars is phenomenal. The condo has a Hawaiian decor.We want our guests to feel the aloha spirit. Ohana means family we treat you like family. Rent from us and you will not have to wait in lines at the desk to check in or check out. The Hawaiian Inn has large outdoor pool and a hot indoor pool, tiki bar is open daily and our aloha dinner and show is held in the show lounge. The Hawaiian Inn is a fun place for your vacation. Maholo your host. Allow us to introduce ourselves. We are Lynn and Jerry from Chicago IL. We have been renting our 3 studio condos for over 16 years now. All of our vacation rentals offer a smoke free and no pet environment. Over the years we have had hundreds of happy guests, many return year after year. We would like to add you to our list of happy vacationers. Our resort studio unit is also our home away from home. It is much better equipped and furnished than studios rented thru the resort. When you rent from us there is no need to stand in lines at the front desk to check in or check out. We encourage you to contact us directly for additional information or to reserve your dates. We never make a reservation with out speaking with our prospective guests. Full ocean and pool view a large swimming pool, indoor hot pool-tiki bar/game area.mini golf and shuffle board by pool deck Our unit has a queen bed, sleeper sofa, new kitchen with full size frig, new stove with oven, microwave, toaster, coffee pot, and, crock pot. We offer plenty of, glass ware, cookware, and silverware. We have a large flat screen T.V. a radio/cd player and a VCR and DVD player - bring your own music and movies. Towels and bedding are provided. Beach toys also provided. Overall a great week based on the unit location. A few comments...I was only given 2 rolls of toilet paper. There was a used, dirty wash cloth hanging in the shower. I wish the furnishings were nicer. I realize I got a bargain, but felt the furnishings were too thrift store feeling. In the 16 years we have owned this studio condo unit this is the first what I would call a negative review. I think this guest came expecting a hotel experience, we rent a vacation rental property no maid service we only supply a start up of paper products, the guest must do shopping for their stay. While we take offense to the notion that the furnishings are thrift store like, I do agree that both sofa sleeper and the recliner are in need of replacement and we are searching out our best options for replacement. However in the mean time they remain clean and very serviceable. The photo's posted are actual untouched photos and when the new furniture is in place the photo's will be updated. Our guests always get exactly what they are shown in our advertising and the fact that we only supply a start up of paper products is clearly stated in the paperwork we send to every guest. Our guests always receive a great value for their hard earned dollar and will continue to receive a great value for their dollar. THIS WAS OUR 4TH TRIP TO HAWAIAN INN ,RICK and Linda S.
Staying here was almost like being on a cruise ship: beautiful view of the ocean and pool, entertainment each afternoon pool side, and great food (the tikihut really puts out a great meal.) The unit is clean and has everything you need for a great time at the beach, including sand toys. Really enjoyed our week here. Great places to eat were close by; hardly had to drive the car at all. Would spend a week here again in a heart beat. This was the first time that we stayed at Lynn & Jerry’s condo and we truly loved it. The condo was clean, spacious, cozy and had everything we needed. The view was absolutely awesome, even from the kitchen! The condo was very close to the stairwell, so we didn’t have to wait for an elevator. Lynn & Jerry are very nice people and were easy to work with. We loved staying in their condo so much that we’re returning in 2014. The one bed room is a great room for us because it is close to the elevators,my wife wheel chair. Lynn it was great talking with you, you were so helpful & we enjoyed our stay. We belive that you cannot find a better condo for the price. Swimming,walking the beach,fishing,surfing,sight seeing,golf,water-parks are close by and only about 60 minutes to most central Florida attractions. All our rates are flexible we try to not be undersold. Call us for special deals or discounts that may be available. Rates do not include Cleaning. Special event rates are $150 per night 5 nite min. Please phone for reservations credit cards accepted. No smoking no pets must be 21 to rent We have put a lot of time,work,money into the Hawaiian Inn. We are proud of the Resort and our Units.